Airflows were upscale and complicated. Hudson Terraplanes were at the other end of the spectrum. The same size and class of automobile, Terraplanes were simpler, more basic, but still had unique features and character. The 1930s were a time of significant change in automotive design. 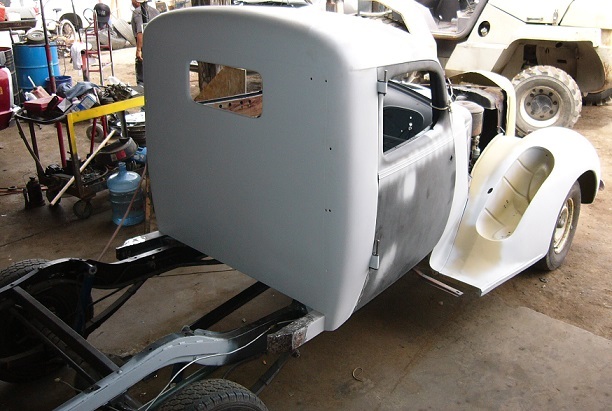 1930 cars were based on the old carriage design, a wooden body on a separate chassis, with carriage design still especially apparent in the back of the car. By 1940, cars had gone all metal, were sleeker (if heavier) but had more power and looked more like cars do now. There's a bigger change between 1934 and 1936 cars than between 1936 and 1939. 1936 may represent the most significant transition year. Things the Airflow pioneered, were being widely adopted by other cars. One thing that changed was the transition from fabric insert roofs to single piece in 1936, stamped steel roofs ("turret tops"). 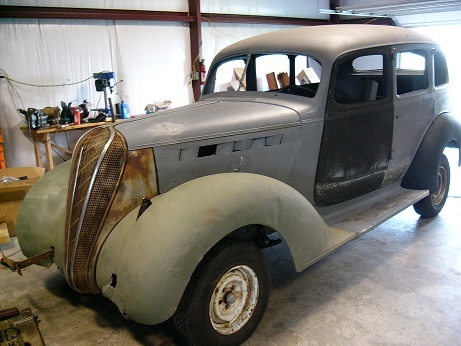 Because other '36 cars were coming out with steel roofs, Chrysler replaced the fabric roof panel of 34-35 Airflows with the steel panel of the '36 to keep up. 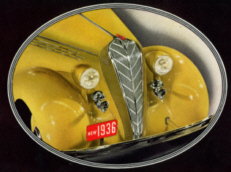 1936 was sort of a one-of year for Terraplanes. Starting in '37, there were lots of differences - engines, floorpan design, doors hinged at the front, dashboard gauges, things like that. The '36 has no oil filter, but it has a pump. Overall, the exteriors are similar, but most '37 parts fit only '37. 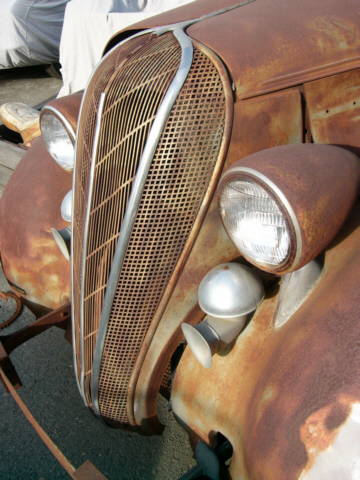 '35 Terraplanes had a different front grille altogether. 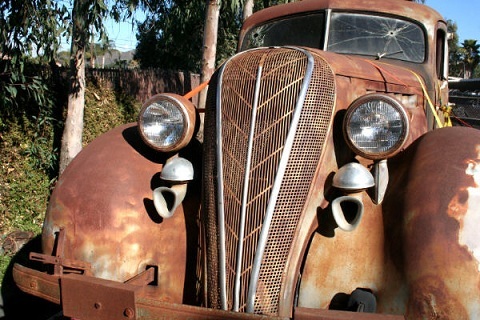 For years I'd been looking for a '36 Terraplane pickup, but they are very hard to find - there's only eight of them left that are known to exist. After looking for several years, I sort of gave up the notion of ever getting one, and went ahead and picked up the sedan as a start. Found one on ebay on a Buy It Now basis that had been listed only a few hours before, so I jumped on it. I hoped that at some point I'd still find a pickup somewhere, but I thought I could start redoing parts that could move to a pickup if I ever did find one. 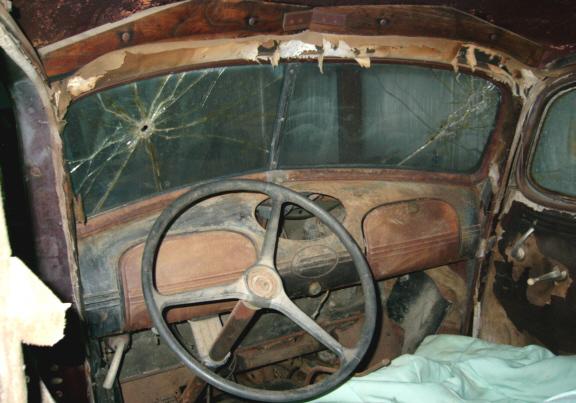 The car was last driven in 1951 in Minnesota and parked where it apparently sat for decades. In early 2007 it was brought to San Diego. I purchased the car in June 2007, and shipped it to Warrensburg, Missouri to get work done. 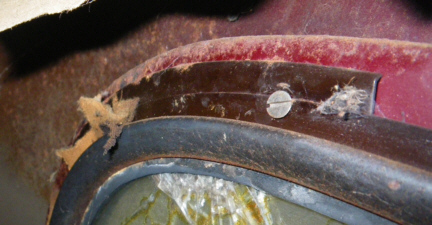 The car was entirely complete, but there was rust in front floorpans, around the trunk floor and the bottom door edges. 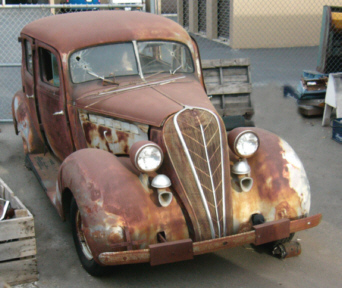 The hood ornament was missing, and the wheels were not original, but otherwise everything that had been on that car when produced in 1936 was still there. I have a soft spot for once-great cars of the 30s, but which have almost died. Bringing ones like this back from the brink is often the only way to get one. Terraplanes are rather easy to work on. Sheet metal and other major parts are hard to come by, but mechanical parts can be cheap and often available through NAPA, so most Terraplanes were hot rodded over the decades. It was sort of rare to find one so complete and original. The poor thing had been through quite an ordeal over the previous 74 years. It didn't take very long to figure out that it had been monkeyed around with by a bunch who didn't understand much about engines. Plug firing order was all wrong, wiring cross connected, you name it. We're not sure what happened to it - the frame had a series of lateral cracks running forward from bolt penetration holes, but yet the frame was pretty decent. When it arrived, the rear bumper attachment to the frame was almost completely broken and could be moved by hand. I'm thinking it was used on a farm for quite a while. The heavy bumper plates on the front suggest that it was used to push and pull things around. The shackle bushing were completely shot all around, the rear shocks were gone, and most suspension parts seemed to be just beat, like it had been driven a lot in fields. Restoration's been going on and off for several years. Click HERE to see where we're at now. There was a large amount of original paint left around the interior of the rear windows - a nice maroon color. Work continued on the sedan for a couple of years. But even with all the work done on it, there was still going to be a lot to do. 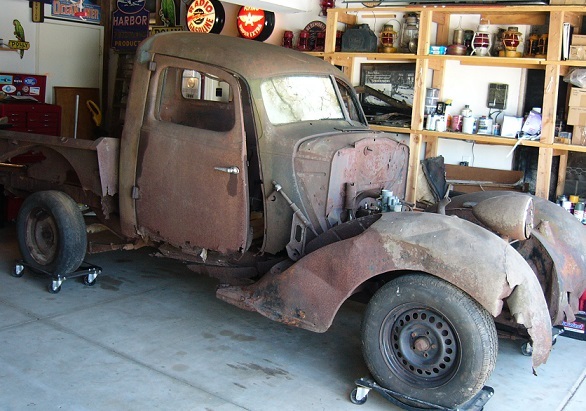 So, in April 2014, a super rare '36 pickup rustbucket finally appeared on ebay for just 1500, and I was the only one who bid on it. Once I got it delivered, a 'command decision' was made to go ahead and use the sedan as a donor car for the pickup, as the plan had been all along. In just three months, the major surgery was done - the truck was running around.